Subterranean Garden is taken from Undefinable Places In-between—a series of short essays I have written, and continue to write, under that title. Under a hill in Mittagong, New South Wales, there is this dark, subterranean garden. The hill is a piece of the rim of an ancient volcano, and the garden—laid down in an old single-line railway tunnel—is over half a kilometre long and sealed at either end with high security steel doors. 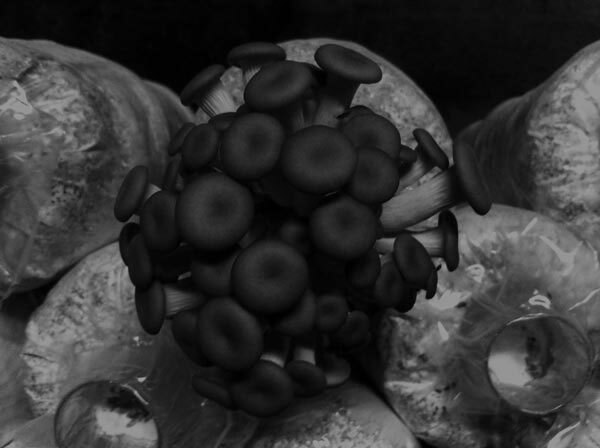 Inside, exotic mushrooms are grown from cylinders of compressed eucalyptus sawdust. The eucalyptus ‘logs’ are evenly spaced on steel grids that line either side of the tunnel. The concrete floor appears to be a continuous, door-to-door slab. These concealed places are deeply attractive; although the word ‘attractive’ by itself hardly covers the uncanny feeling that something magical could also be present, as well as something slightly menacing. ‘Enchantment’, in this instance, is probably not too fanciful a word to cover a range of feelings or atmospheres that these hidden places evoke. Secret gardens, grottoes, wells, the Underworld of the ancient Greeks, ‘bottomless’ lakes, limestone country sinkholes, the earthy home of Mole in Wind in the Willows, the lairs of oracles and hermits, burial chambers, crypts, deep caves holding yet-to-be-discovered prehistoric paintings, the imaginary underground dwellings of all manner of ‘little folk’, and hollows under hills that in European mythology were usually occupied by strange otherworldly beings — are all places of enchantment. Li Sun Exotic Mushrooms is a mushroom farm between the Southern Highlands towns of Mittagong and Bowral in New South Wales, Australia. Mittagong is said to be the local Aboriginal word for Little Mountain*. It refers to the hill through which the railway tunnel is cut. On maps its name is Mount Gibralter. I regret not also being able to tackle this writing from the point of view of pre-European history and mythology. This region must have been rich in flora and fauna and would have supported many people in those thousands of years before colonisation — and it would have had a rich history and mythology to go with it. Like most places in Australia, particularly those farmable areas occupied early by Europeans, much of the Indigenous history has been lost along with the languages. The Eurocentricity of the last paragraph in my garden story is evidence of this lost knowledge.